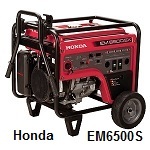 Mar 25 , 2019 - With the advent of more and more storms that create power outages for us these days, it is really a wonderful thing to have a power generator for electricity at home when the utility power goes out. 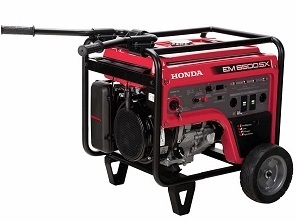 If you don't know how to get electricity during a power outage then read this page about reliable portable power generators for your home emergencies. Ideally it would be nice to have a whole house generator as a backup power supply, so you can have all your normal electrical conveniences available to you during the outage. However, that can be an expensive solution. 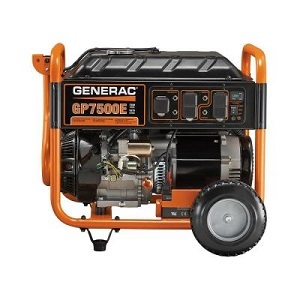 Due to this expense and since power outages usually only last for a few hours to a few days, you may decide that there are only a few items in your house that you just can't do without and that a portable generator will meet your needs just fine. Most people want to keep their refrigerator and freezer going in order not to loose those expensive perisables of food in them. If someone in your household has medical devices that need power it is certainly important to keep those devices functioning. Other people would like to keep a TV working in order to keep up with the weather or to keep the kids occupied. Having that morning cup of coffee is usually important to those people who drink coffee. Some electrical devices have more importance to some than others. Take a walk through your home and first decide what items you would really like to keep running during a power outage / cut. Also keep in mind that you won't use something like the microwave all the time. So, you might choose to turn something else off for a few minutes while you cook or heat some food. After you decide what appliances or other electrical devices you want to use you will need to know how many watts they require. Knowing What Wattage You Need will allow you to select a portable generator that will meet your electrical needs. In addition to sufficient wattage you will be interested in other features like weight, noise level, size, fuel efficiency, wheels kits, remote start, etc. 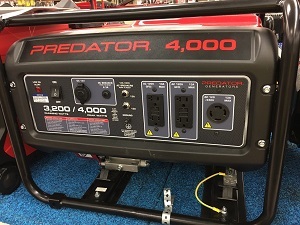 which will be covered in the reviews below for these top rated portable generators for power outages in your home. Honda's exclusive iAVR technology ensures a consistent flow of power regardless of the load. This provides stable power for sensitive equipment and a more reliable power source for you. 6500 watts max, 5500 watts rated, 7000 watts for 10 seconds to start larger equipment. Electric start (battery included) and has recoil start as backup. Operates at 73 dB (A) during rated load. Dry weight 234 lbs., on wheels and has wide, positive lock folding handles for convenient transport and storage. Full frame protection. Great for overnight power - Runs approximately 10.4 hours at half load and 6.9 hours at full load. Fuel tank capacity - 6.2 gallons. Intelligent Automatic Voltage Regulation (iAVR) technology ensures a consistent flow of power regardless of the load. Therefore stable power for sensitive equipment and a more reliable power source for you. Protected by oil alert - shuts down engine when low oil is detected. Electronic circuit breakers - protects the generator from being overloaded. AC Output: 120 / 240V. Receptacles - 20A 125V GFCI Duplex (2), 30A 125V Locking Plug, 30A 125 /250V Locking Plug. Auto Throttle System - automatically reduces engine speed when all loads are turned off or disconnected. When appliances are turned on or reconnected, the engine returns to the rated speed. SAE 10W 30 oil recommended for general use. Honda engine horsepower - 2.8 HP (2.1 kW) @ 3,600 rpm. City traffic in side a car - 85 dB. Normal Conversation at 3 to 5 feet - 60 to 70 dB. Power Saw - 110 dB. Toilet Flushing - 75 dB. 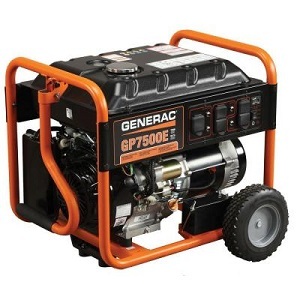 Weight Note - A gallon of gas will add approximately 6 pounds to the dry weight of a generator. 20A 125V GFCI Duplex Receptacle - these are typical receptacles used in bathrooms, kitchens, basement, outdoors of your home. Ground Fault - A ground fault happens whenever electricity escapes the confines of the wiring in a light fixture, an appliance or power tool and takes a shortcut to the ground. When that shortcut is through a human, the results can be deadly. GFCI receptacles keep you safe from Ground Faults. 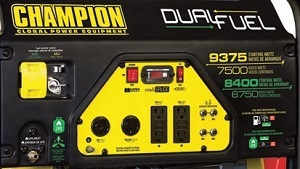 The Champion Power Equipment Dual Fuel Electric Start Portable Generator runs on gasoline or propane. You choose your fuel source simply by sliding the Fuel Selector switch. With the included portability kit transporting from job to job is easy. 7500 running watts / 9375 starting watts. Electric Start, Easy pull recoil backup. Noise Level - 74 dBA. Fuel usage, runs for 5 hours at a 50% load on a 20lb. (5 gallon) propane tank. Gasoline Fuel tank capacity - 6.1 gallons. Heavy duty 1.5" steel frame. Isolation motor mounts provide smooth, quiet operation. Intelligauge digital display monitors running hours, voltage and hertz. Low oil shutdown offers protection. Champion 439cc OHV engine with cast iron sleeve. Includes 10" never-flat wheels and U-shaped handle. 120 Volt AC, 30 Amp Twist-Lock Receptacle (NEMA L5-30R) - used to supply electrical power for the operation of 120 Volt AC, single phase 60 Hz electrical loads. 120/240 Volt AC, 30 Amp Twist-Lock Receptacle (NEMA l14-30R)- May be used to supply electrical power for the operation of 120 and/or 240 Volt AC, single phase 60 Hz electrical loads. Two 120 Volt AC, 20 Amp Duplex (GFCI 5-20R) - May be used to supply electrical power for the operation of 120 Volt AC, single phase 60 Hz electrical loads. 31.25 Amps at 240 volts. Includes: Oil funnel, spark plug socket, Wheel and handle kit and LPG hose with regulator (3.3 ft.). Add a weatherproof Champion generator cover to protect your generator when in storage. CARB Compliant Generators - CARB stands for California Air Resources Board. CARB is an agency that deals with environmental protection, specifically air pollution. 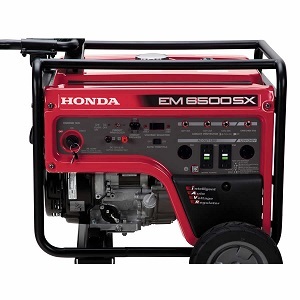 Added Weight - 1 gallon of gas will add approximately 6 pounds to the dry weight of a generator. Surge Wattage - Surge wattage is the extra burst of power needed to start some electric driven equipment. Twist Lock Receptacle and Plug - A power plug and receptacle in which the plug must be twisted after insertion to lock it in place in order to guard against the plug accidentally being knocked loose. NEMA - National Electrical Manufacturers Association. Single Phase - refers to a two wire AC (alternating current) power circuit. Typically there is one power wire and one neutral wire. In the US 120V is the standard single phase voltage with one 120V power wire and one neutral wire. The Generac GP7500E offers 7500 Running watts, is gasoline powered and has a low-tone muffler which helps ensure quiet operation. 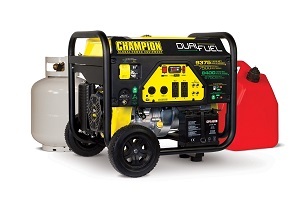 With a 7.5 gallon steel fuel tank you can get continuous power for up to 11 hours at 50% load. The Generac OHV offers increased fuel efficiency, a cooler running engine and reduced oil consumption. With the convenience of electric start, the GP7500E is a popular choice for emergency backup power, recreation and job site useage. Electric start with recoil backup, battery included. Low tone muffler helps insure quiet operation. 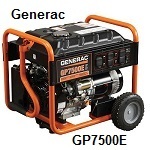 Generac does not publish a db rating for their generators. Fuel usage, 11 hours at 50% load. Fuel tank capacity - 7.5 gallon steel tank with conveniently positioned easy to read fuel gauge that provides at-a-glance fuel monitoring. Ergonomic fold down locking handle to make transport and storage easy. Covered, circuit breaker protected outlets provide added protecton from the environment and rugged working conditions. Heavy duty 9.5" solid wheels for reliable portability. Four 120-Volt 5-20R outlets and one 120/240 Volt L14-30R twist lock outlet are circuit breaker protected. Low oil shutdown that detects a low oil level and shuts the engine down to prevent engine damage. Muffler - A muffler is a device for decreasing the amount of noise emitted by the exhaust of an internal combustion engine. Ergonomic - Intended to provide optimum comfort and to avoid stress or injury. User-friendly. OSHA - Occupational Safety and Health Administration. OSHA is a federal organization that ensures safe and healthy working condition for Americans by enforcing standards and providing workplace safety training. 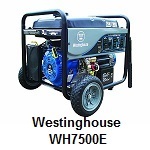 Westinghouse has taken years of expertise and created a powerful package in the WH7500E Gas Powered Portable Generator to be used at your home during utility power outages. This generator has one of the longest run times compared to other generators. 7500 running watts / 9000 starting watts. Westinghouse One-Touch Electric Start System and Recoil for backup. Quiet operation via our Pulse-Flo muffler, creating one of the quietest generators on the market. Fuel tank capacity - 6.6 gallons. Westinghouse cast iron sleeved 420 cc engine. L14-30R 120/240 Twist Lock (Quantity 1). EZ start color-coded touch points. Wheel kit, Assembly tools and Oil and Funnel Included with generator. Easy to operator with a simplified power control center. Add a Westinghouse generator cover to protect your generator from dirt and grim while in storage. Engine Power - Engine displacement is the volume of an engine’s cylinders, a general indicator of its size and power. The displacement figure represents the total air displaced by the pistons in all of an engine’s cylinders and is expressed in liters, cubic centimeters or cubic inches. The size of these cylinders loosely defines the size of the explosion within, which is why displacement suggests an engine’s power. That said, many other factors affect an engine’s output, including the number of cylinders, the compression ratio within the cylinders and the induction system. 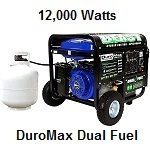 With Max 12,000 Watts the DuroMax Hybrid Dual Fuel XP12000EH will have you prepared for any home power outages. 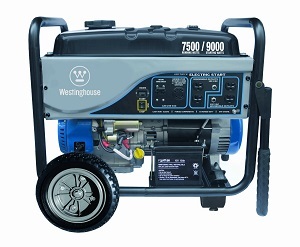 The dual-fuel, gas or propane fuel source generator, nicknamed the BEAST, will provide you power normally found in home standby units but in a portable package. 9500 rated AC Output ( Watts ) / 12000 Max AC Output ( Watts ). Electric Start System with Recoil for backup. Heavy duty frame with four point fully isolated motor mounts for smooth quiet operation. Noise reducing muffler also uses a spark arrestor making the "Beast" EPA approved for safe use in U. S. National Parks. Run time Gas @ 50% Maximum Output = 10 hrs. Run Time Propane @ 50% Maximum Output = 20 hrs. Fuel tank capacity (Gasoline) - 8.3 gallons. 18 Hp DuroMax Air Cooled 457cc OHV Engine. 120V 20 Amp Receptacles (Quantity 2). 120V 30 Amp Twist Lock Receptacle (Quantity 1). 120V / 240V 50 Amp Heavy Duty Outlet (Qty. 1). 10A 12V Utility connection for charging a battery or running 12V devices. Wheel kit, Tool Kit and Operating Manual Included with generator. Amps - 79.2A / 39.6A. 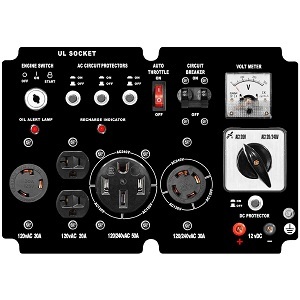 Full power panel with oil warning light, volt meter, power outlets and individual circuit breakers to prevent overloading and keep everything safe. 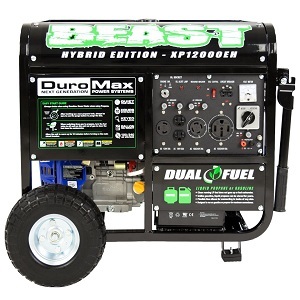 DuroMax Generators are perfect for any application where portable power is needed, whether it is camping in the woods or because of a natural disaster. 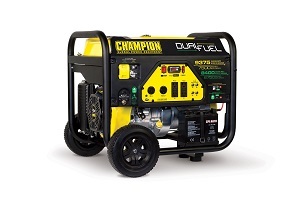 Heavy Duty Frame Powerful DuroMax Generator Dual Fuel ( Gas / Propane ) 12000 Watts with Electric Start System. DuroMax Generators are powerful generators manufactured by DuroPower, a California based engine and power tool making company. Unlike most brands, DuroPower actually build their own engines thus, ensuring quality. 3200 Running Watts / 4000 Peak Watts. Fuel tank capacity (Gasoline) - 4 Gallons. 6.5 Hp Predator Air Cooled single piston 212cc OHV Gas Engine. 120V 20 Amp Receptacles (Quantity 2), 3 prong. 240V 30 Amp Heavy Duty Twist Lock Outlet (Qty. 1), 4 prong. 12V DC outlet (Quantity 1). Heavy Duty 1 inch steel roll cage. Low oil indicator / low oil shutdown. 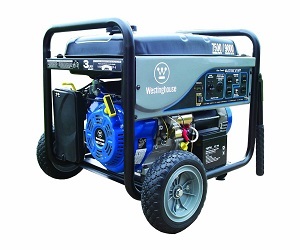 If you plan to move this generator around a lot you may want to buy a wheel and handle kit as well. Good for RV Trailers and Power Outages duing emergencies. Heavy Duty Steel Roll Cage Predator 4000 Generator for Power Outages, RV Trailers, Campers and more. 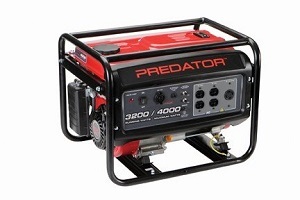 C & R Industries are the manufacturer of Predator Power Products. A range of petrol and diesel driven equipment ranging from water pumps and pressure cleaners to petrol powered generators. If you have not read the section on Generator Safety please do so before purchasing.